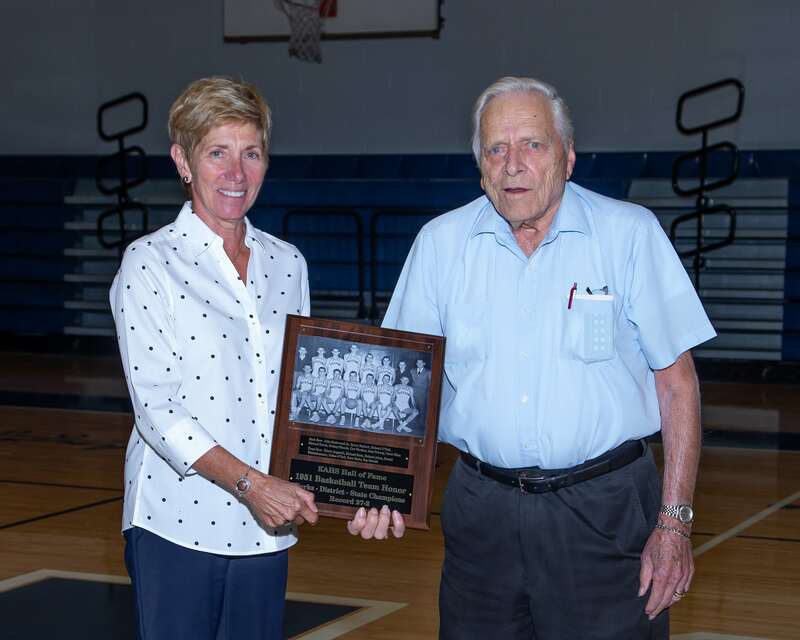 On September 7, the 1951 Boys Basketball Team was honored by the KAHS Athletic Hall of Fame. Mr. Carl Wuchter represented the team at the evening’s proceedings. Ms. Lynn Silan represented her father, the legendary Coach John Silan, receiving the team’s plaque. The 1951 State Championship Team had a record of 27 wins and 2 losses. They were also Division, Berks County, District III and Eastern Pennsylvania Champions. Team Members included Richard Adam, Edwin Angstadt, Pete Barto, Byron Burkett, Edward Hauck, Richard Hoch, Dallas O’Neil, Richard O’Neil, Ray Oswald, Rodney Rhoads, Ronald Weidenhammer, Carl Wuchter, John Silan (Coach), John Rothermel (manager), Alan DeLong (Manager), and Donald Angstadt (Manager). 2004 Hall of Fame Inductee, Mr. Dennis DeTurk, summarized the team’s accomplishments at the Hall of Fame dinner held in the KAHS cafeteria, and joked with team player Carl Wuchter, asking what happened after starting the season with 2 losses to cause them to go on to win their next 27 games straight. He also remarked on Ronald “Mike” Weidenhammer’s 436 points scored in 1951, noting that this occurred before the 3-point rule came into effect. The crowd was heartily entertained by Mr. DeTurk’s look back at 1951. He invited them to come to the Kutztown Area Historical Society to see all of the KAHS basketball banners won between 1949 and 1967, as well as many of their trophies.